Class Format: On-demand teleclass to take anytime, at your convenience. You will receive links to 5 hours of MP3 recordings (from a live class which includes the questions, comments and interactions of the participants with the instructor) and PDF’s containing 71 pages of detailed handouts. Who Should Attend: For anyone who loves animals, including practitioners who work with animals (such as veterinary professionals, pet loss grief counselors, animal communicators and all animal care professionals) and those who are guardians to animals, and want to better understand how animals grieve and to be well prepared to help animals with their grief and grief-related stress or trauma, and to plan for companion animals’ care when their guardian can no longer do so. Learn specific ways to help animals cope with and heal through loss, grief and starting over when they have lost their families, their friends and/or their home. and trauma of companion animals, and all animals. 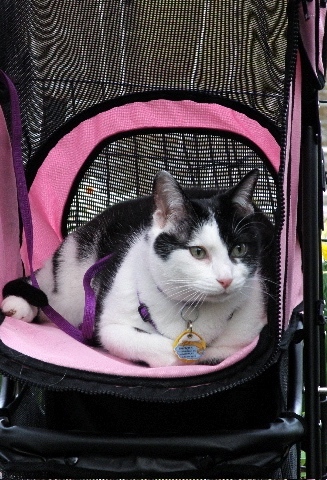 Learn how to leave a legacy of both physical guardianship and emotional support for your animals’ care in the event of your death or if you are are no longer able to care for them. T he purpose of this class is to help humans become more aware of and sensitive to the very real grief that animals experience, and how to plan for and provide support for their grief-related stress and trauma in various situations of loss and transition, including rehoming. 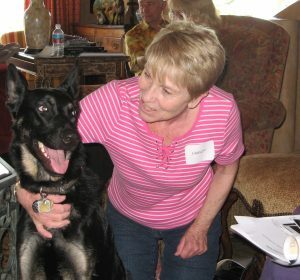 The class also provides detailed information about how to leave a legacy of both physical guardianship and emotional support for our animal’s care if we predecease them or can no longer care for them. Though this class is for human participants and human learning, it is ultimately a class which serves the animals because it teaches us how to prevent and/or mitigate the stress and trauma that is often involved when animals grieve. 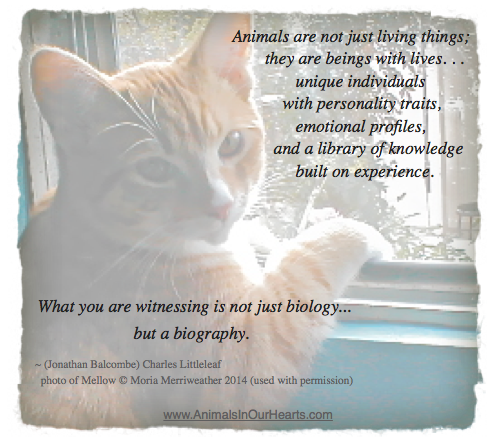 When I began my professional animal communication practice in 1991, I learned two things fairly quickly: That animals experience the same emotional range as humans, and that they are each unique in the way they experience and express their emotions—just like humans. Anthropologists and scientists at times concede that some animals might grieve given observed behaviors, but there must be research to “prove” it. They seem reluctant to acknowledge that anything that cannot be proven in physically measurable terms could actually be real, and that somehow only animals with brains the size of human brains or larger may have much emotional capacity. On the other end of the continuum, in new age literature and teachings, erroneous myths and assumptions abound that animals either don’t feel grief because “they all live in the moment and do not hold onto any emotions,” or they get over it quickly, based on theories that animals are “more evolved” than humans and so they do not experience any emotional suffering. Neither of these positions—scientific or new age— is aligned with what I’ve heard from thousands of animals over the years who have grieved deeply when abandoned or lost loved ones. More importantly, neither of these positions serve the animals who suffer loss, trauma and grief because both tell a story that most, if not all, animals don’t even experience grief. The idea that animals do not grieve or suffer from loss is typically circulated by people who don’t communicate with animals, or who believe that animals are “lesser beings” than humans. When we do talk with animals, having full, interactive conversations with those who have experienced loss, carefully listening to their stories and being open to fully witness their pain, it is abundantly clear that they grieve. Sometimes their grief is so obvious from observation alone that only a closed-hearted, closed-minded person who believes only what science can measure would deny that the animal’s grief is real. There is no hierarchy amongst species regarding who grieves. 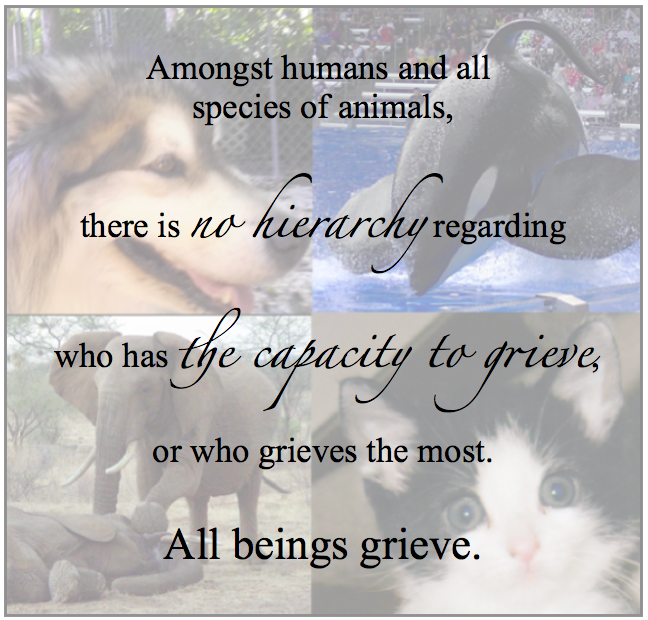 All beings grieve. To know this, we must acknowledge that some truth in the world is perceived and felt by the heart, not by the intellectual mind or by scientific proof. In this class we’ll discuss dozens of true stories of animals who have experienced grieving—from elephants, whales, chimpanzees and snakes in the wild to dogs, cats, birds, horses, cows and goats living with humans. We’ll review specific ways to support animals who are grieving, whether it’s helping your own companion animals through the loss of a family member (animal or human), helping your adopted rescue animals cope and heal from their losses and grief from their past, wild animals grieving the loss of loved ones from natural death, natural disasters, intentional human killing or from being kidnapped and forced to live in captivity. We’ll discuss ways in which we can anticipate and plan for potential grief and grief-related stress of our animal companions to help mitigate their stress and emotional pain. We’ll also review ways in which we can help wild animals who are grieving even without being anywhere close to their physical location. You might also be interested in the related class Animals Perspectives and Stories about Death, The Other Side and Coming Back. 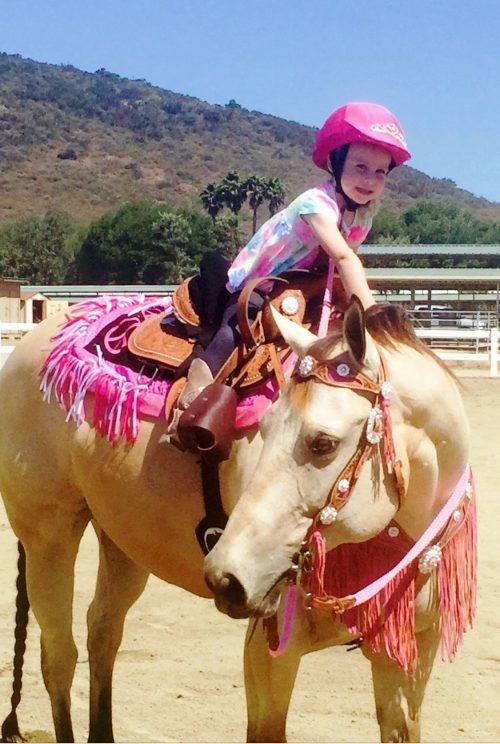 What Emotional support do I want my animal to receive? EVERYONE who cares for an animal should take this class!! This was a very comprehensive, extremely thorough and detailed class covering the many varied ways and situations where animals do indeed suffer and grieve. Teresa’s always exemplary organization, range of experience, discernments, biocentric perspectives, and deep thought that she put into the topic made this class MORE than worth taking. Despite already having become quite familiar with much of the content through my own path and experience, having it all handily researched and grouped together in her extensive and beautifully presented handouts created an invaluable wealth of information and brilliant tools to keep on hand and work through! Class participation was also helpful and informative. As ever, Teresa’s soothing voice and gentle guidance throughout helps ease you through most unsettling emotions evoked from the material. I admire, respect and love Teresa and her works SO very much! EVERYONE who cares for an animal, or is asked to be a possible, future guardian, should take this class!! I can’t say enough about Teresa and her classes, She always frames things so eloquently and gently, is highly organized, is a fellow deep thinker, is very compassionate, has excellent timing, and delivers such superb value in her classes! The handouts were excellently done, beautifully illustrated, and most of the quotes/posters used were outstanding and on point! Topics were interesting and informative. Handouts are great to have for reference and as worksheets. Lots of links to additional resources. I was glad to see that rehoming was included as well as fostering. My most significant learning from the class is that animals are individuals and grief will manifest differently for each of them. Always great to learn from Teresa’s extensive background and experience. The group exercise on sending love and calm was extremely valuable. I tried sending love and calm to shelter dogs today and did feel that it helped them. There was a noticeable difference in temperament from shaking and very shy to relaxed and happy. It works! Thank you so much. It was a simple reminder that all living things have a cause and effect relation in our lives and all living things have a right to their preferences regarding their life and choices. I received valuable guidance that sending love for even just a minute is a valuable tool; sending love and healing to the mass consciousness of all animals would be just as valuable. Her experience with these past issues were very valuable. Learned that can help them and that they don’t always show their grief to us even though they are in emotional pain. I also didn’t realize that there is a change in their role in the home. That they can feel confused about their place. I’ve known that the death of my mother and all the turmoil was hard for her dog Tess and with so much going on, there wasn’t a lot of help for her. I better understand now why her behavior changed when I took her home. The handouts weren’t just information but an excellent workbook for what we need to do. The web sites were an eye opener. What I hadn’t thought about but had experienced was the illustration of Anthropocentrism. It’s true. Teresa was great at guiding the study and input. Brought out a lot of information that we usually don’t think about. The animals and their needs are the focus and the help we need to take care of them was well presented. I honestly hadn’t give much thought before about how important it is to plan for their care after we are gone. . . but I do now! I feel very confident that I can now have a very detailed plan for them and know they will be taken care of in the way they deserve if I go before them. 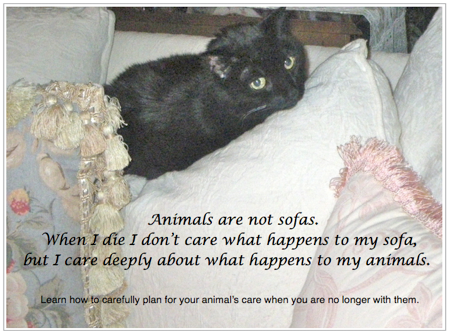 I also learn a GREAT deal about how to help when animals grieve and are sad from the loss of an animal and person. Can’t believe how much was packed into this class! Thank you!